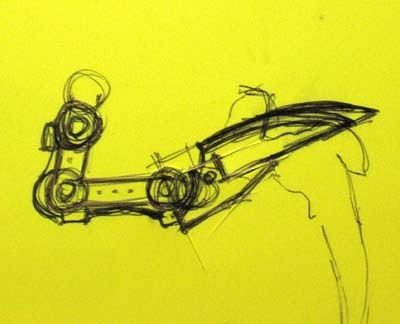 Alright, we all know Sarpedon has a bionic arm... but how do you represent it? How do you "make one" that fits with the look of the rest of the model? And it had to be plastic if possible, that was the other criteria from my client. Like me, I don't think he cares for metal models much either. The first step was seeing if there was anything out there I could convert into something suitable. Not really. Some things close, but not exactly what I was looking for. 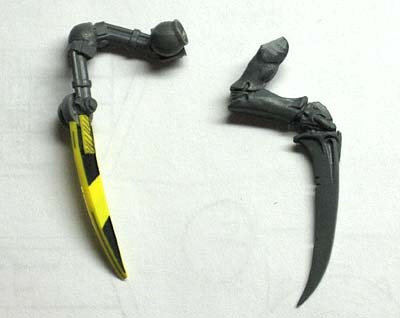 I settled on making it from scratch and trying to mimic something like an arm from a Techmarine. 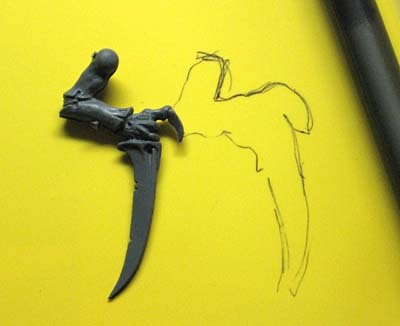 I took one of the other legs (since I wanted the bionic one to be similar in size and shape) and traced it onto some plasticard. This was going to be my base shape to work from. A quick sketch provided a workable arm. I doubled up the plasticard and cut out the rough shape. Looks good I thought, and then I started comparing my bionic arm to the other legs and I realised it was junk. Way too flat and lifeless to be part of this model. It needed some kind of life and mass for the conversion to work. So I scrapped my first attempt entirely. Back to the bits box to see what I could use. I ended up stumbling on a perfect solution and had just the right pieces to make it work. 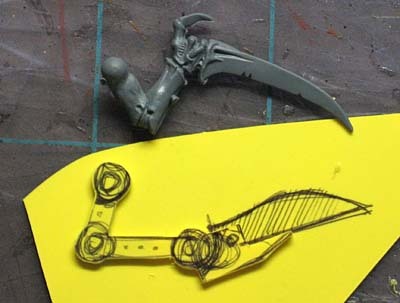 I used two vents from a space marine backpack, two hydraulic arms from the plastic Landspeeder set (for the Typhoon conversion I think) and some other what nots for details. The blade is copied from the blade shape of the real legs to keep it consistent and is made of doubled up plasticard for thickness. It will attach to the body with a magnet so that it can be removed. The bionic arm doubles as a wound counter for the model. Obviously, this one works way better than my pathetic first attempt. I think my client would have fired me if I kept the first one. This version has lots more life to it and it "looks right." You hit the nail on the head with the second one. This is going to be a great model. so I didnt really need to type all that. Karitas: It's cool, I appreciate it when people offer suggestions or let me know how they would have solved it. I keep all this stuff in my book for when I come across something else and the answer doesn't fall out of the sky into my lap.